The advanced cluster display in the Corvette Stingray can provide up to 69 unique sources of information, ranging from an interactive performance timer to a tyre thread temperature display. The crisp and bright display features make this information easily accessible via three configurable modes that prioritise information for daily commuting, weekend canyon carving and track events. Flanked by three analogue gauges for speed, fuel level, and engine-coolant temperature, the eight-inch liquid-crystal display screen in the centre of the cluster is organised into sport, tour and track themes that change with the Driver Mode Selector. Each display theme is designed for a specific driving scenario and can be configured through applications found in the “app tray”. 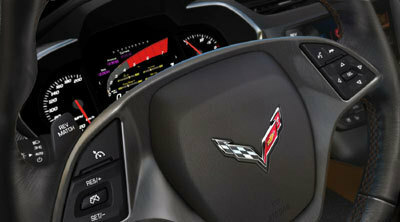 The Corvette Stingray coupe will arrive at select dealerships across Europe toward the end of 2013.